Your escape ship has landed on Kreludor and the pieces of the ship are scattered around! Your job is to explore Kreludor looking for all the pieces you need to put your ship back together. Watch out for the enemies that are roaming around! First you will chose between Gorix and Cylara. Neither is better than the other, they both operate the same. You will use your arrows to move. The spacebar will be used to shoot your laser gun or to push moon rocks out of your way. The enemies walking around Kreludor will kill you if they catch you. The first enemy pictured doesn't do anything special. They just walk around and will make you lose a life if you run into them. The second enemy pictured is a bit different. This enemy will disappear into the ground and reappear coming out of the ground. They can be more difficult because you never know where they are going to pop up from. The third enemy is the same as the second, the picture shows the enemy coming out of the ground. The fourth enemy is about the same as the first enemy. It doesn't do anything special besides follow you around at times. The fifth enemy pictured is the one to worry about. These guys can kick rocks at you and kill you! When you shoot these enemies they will explode. Stay away from them at this time and do not walk over the pieces until they disappear or it can kill you. Like most games you will have three lives. When you lose all three lives, you can restart the game and continue from the last level you completed. However, if you do this you will start at zero points, which gives you less of a chance of getting a high number of points. While playing the game you have 99 seconds to finish each round. There are three cheat codes for this game, each of which can only be used once per game. Typing novisitors will give you 30 extra seconds. Superlaser will give you double laser range for the entire level the code is used on. And lastly, rampage will give you one extra life. This level isn't too difficult. Walk up until you get to the rock which has been marked with a green X on it. Now walk until you cannot go any farther, press the spacebar to kick the block. The block will go into the lava and will stay there, making a path for you to continue. Collect the pieces of the ship and you're on to level 2! Watch out for the enemies as they will show up shortly after you start the level. If they are near you and in your way, turn towards them and hit the spacebar to shoot them. After shooting an enemy another one will appear to take its place, but where it appears is random. The white numbers next to the pieces of the ship you need are how many points that piece is worth. This is pretty easy as well. Just follow the path of the arrows, kicking the blocks marked with the green X. Make sure when you see the blocks that are marked with a green X that you kick them from the direction that the arrows instruct you to, or you may kick it the wrong way and make it harder to finish the level, if not impossible. 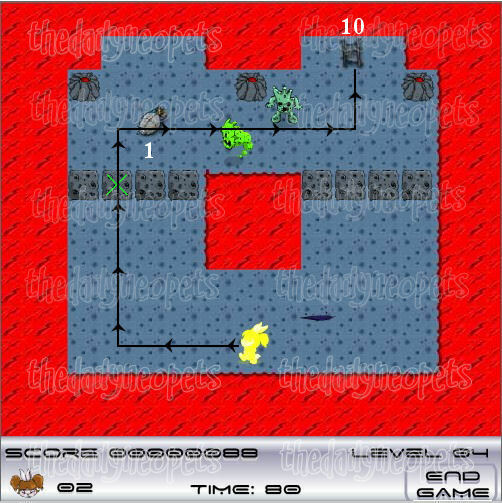 This is the first level that you will see the enemies that disappear into the ground and appear from the ground. The path to the pieces is relatively easy you just need to watch out for the enemies. Once again it's pretty easy to complete. Just push the one rock out of the way and collect the pieces. 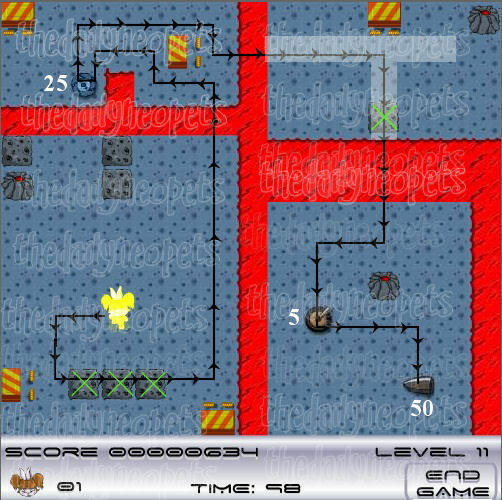 Just be careful for those enemies as they can be a bit tricky in this level. Still pretty simple. You can kick the block into the lava so you can quickly get to the pieces you need. If you run fast enough you can almost collect all the pieces before any enemies show up! 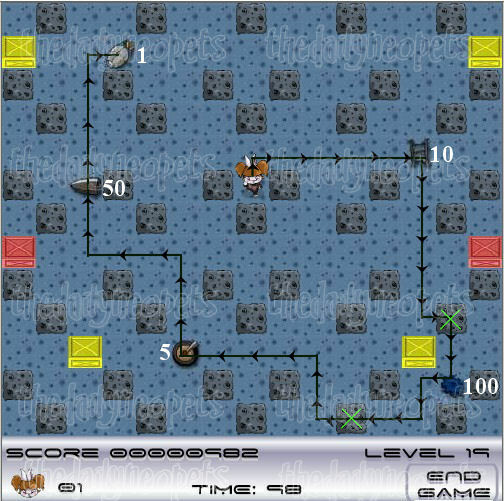 This level is more complicated. First you want to stay where you are but face up. Once an enemy gets to where the blue X is shoot them to make them a block. This will block them in so they cannot come after you. Then follow the arrows and push the block up to make a path, and push the other block to the left. The block will hit the spring box and it will push the block in whichever direction is opposite of the front of it. Meaning it will fill the hole in the lava. Make sure to quickly shoot an enemy where the blue X is to block them from coming after you, the correct place to stand to shoot the enemies is marked by a black circle. 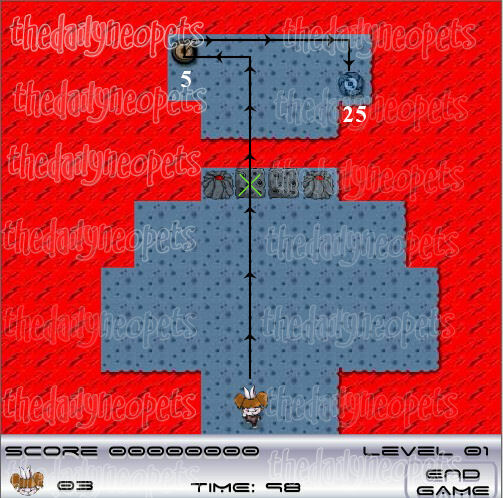 Now go up and collect the piece and go to the right side of the screen and do the same as you did on the left side. Now, before you collect that last piece you can earn some extra points! When you hit an enemy with a block you get points for that. Notice how the enemies are all blocked in the one area. Stand on the right side of the screen between the spring box and your last piece, and directly in front of the block that is blocking them in. Now kick the box towards the enemies. This will usually kill multiple enemies, as you kill more than one enemy with a block the amount of points you get for each enemy killed goes up. When an enemy gets close to you shoot them to make them a block and kick the block towards the rest of them again. Repeat this until your time starts to beep at you and turns red. You should have plenty of time to quickly go up to the last piece. 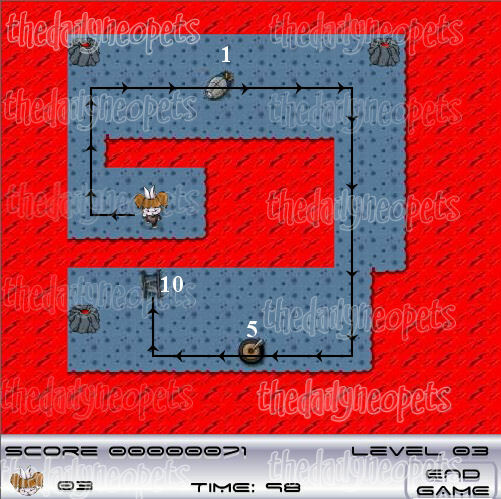 After level 6 you deserve an easy level! This one is very simple, kick the block into the lava to make a path and go right to the piece. You shouldn't have to worry about any enemies since this is such a simple and quick level to complete! This level you will see a new enemy. You are now faced with the enemies that can kick blocks at you and have those dangerous explosions when you kill them. This level is relatively simple, it's just keeping away from the enemies that is difficult. First kick the block with the green X that the arrows lead to. This block will then hit the next block that is marked with a green X. The second block will go into the lava and the block you just kicked will stop where it hit the other block. Now kick that block again to make a path to the first piece you need to collect. Make your way up to the other pieces while watching where the enemies are. Remember these enemies can kick the blocks at you. 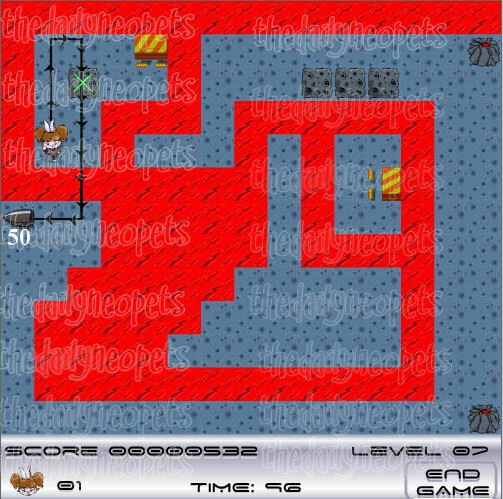 This level isn't too difficult you just have a lot of places to go. 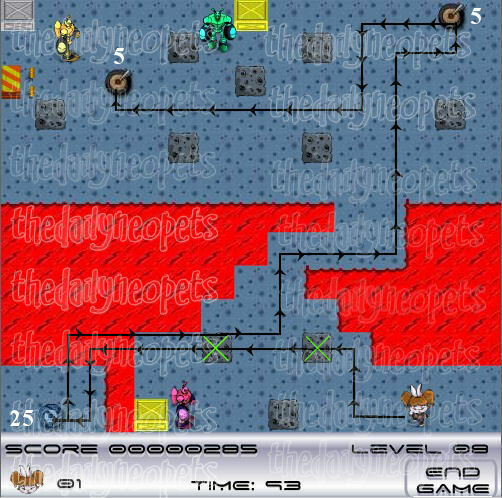 Follow the arrows to the first block and kick it into the lava to collect the piece. This area can be a bit tricky, it's a tight squeeze and an enemy will pop up in that area. 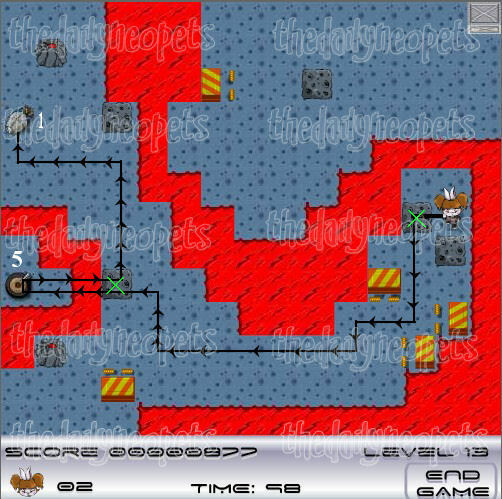 Make your way over to the right side of the screen and kick the block into the lava, as indicated by the arrows. Collect the piece and avoid the enemies. There are generally two enemies in this area. Now make your way up to the top of the screen. When you reach the top, stop before you kick the first block. Wait for the enemy to walk between the blocks and then kick the block. This will kill your enemy and gain you some points. Again that block will hit the other and it will take its place. Collect your piece, kick the next block, and hurry to the last piece. This level is pretty simple. 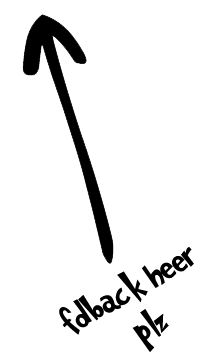 Kick the block up, which will take place of the other block with the green X. Now kick the block towards the lava. Quickly collect the ship piece, kick another block to the next set of lava on the right and get the last piece. The only difficult part is getting around all of the enemies. Remember if they are near you just shoot them! 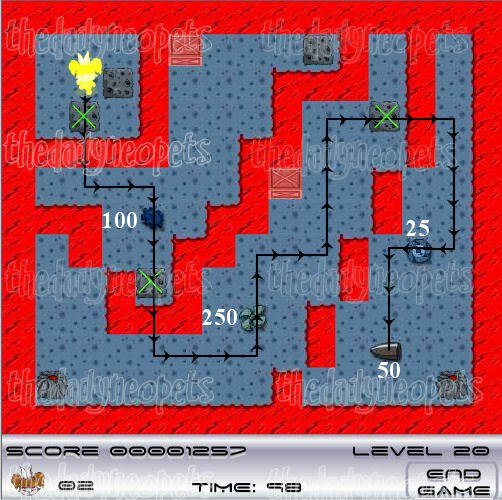 Another difficult level. You need to kick the blocks marked with an X so the spring box will push them up the screen. Kick them all until you have no more blocks there. This will place a block in the lava to get to the top of the screen and one to get the top right as well. Collect your ship piece and make your way to the right side of the screen. Now you will see that you need to fill some more lava to get to your last two pieces. You only have one block to do this and you need two. The part that is shaded is where you will need to shoot an enemy to turn it into a rock. Once you do this kick the blocks where the arrows leading over the lava are. Then collect your pieces at the bottom. Remember to watch out for those enemies. 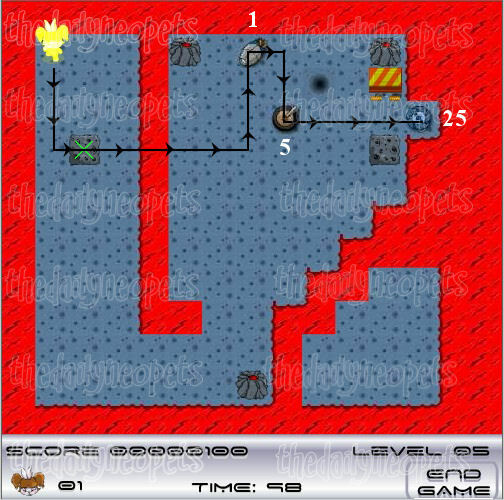 This level may look hard, but it's rather easy. 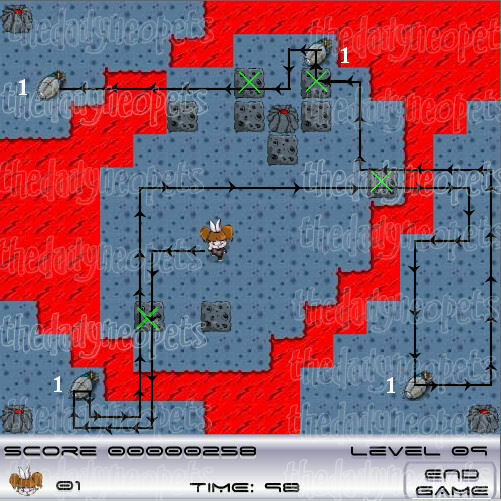 Kick the block to cross the lava, then stop where the black dot is located. The blocks will the stars you will need to shoot four times and they will disappear. DO NOT KICK THEM! If you kick the blocks they will come right back at you after hitting the spring box and will kill you. If you do kick the block move out of its path quickly and wait until it stops moving. 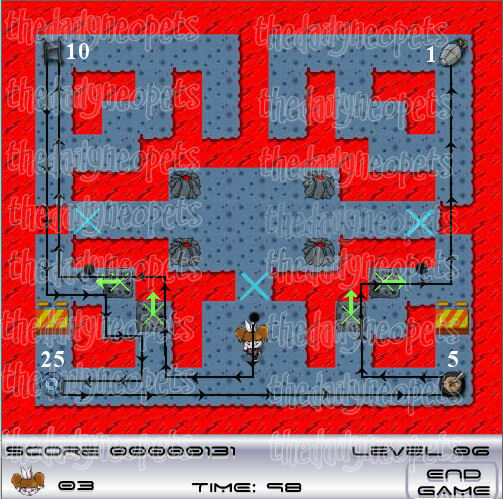 You will not need to worry about any enemies in this level since they are blocked at the top of the screen. This level isn't that difficult. 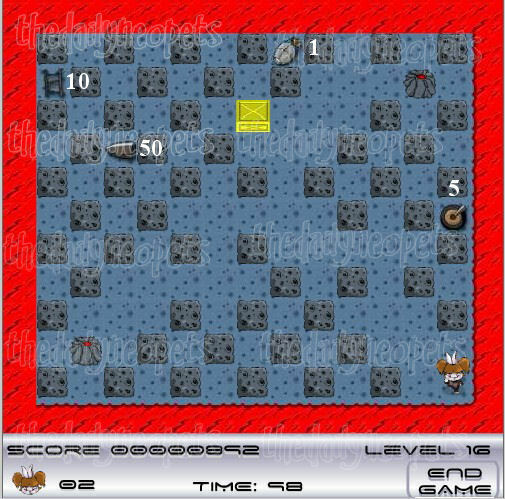 Just kick the blocks where the arrows show and hurry to collect your pieces. The most difficult part is staying away from the enemies in this level. 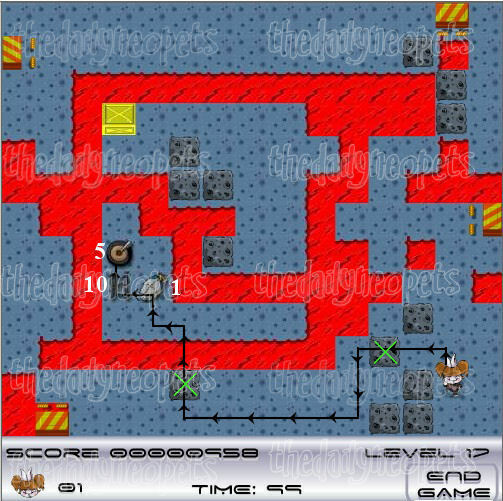 As you can see you will need blocks to kick into the lava to get to your pieces, but there are no blocks around. You will need to wait for an enemy to arrive to shoot them to become a block. 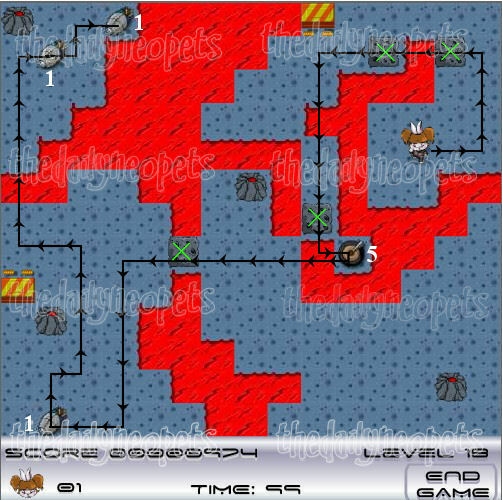 The shaded areas are where the enemy needs to be killed for you to use them as a block to get across the lava. The arrows are just to give you an idea of the path to take. It will not be exact since you are depending on enemies to turn into blocks. Another easy level. Just kick the blocks where instructed and follow the arrows. Keep an eye out for enemies they can be a bit tricky in the upper right corner of the screen. 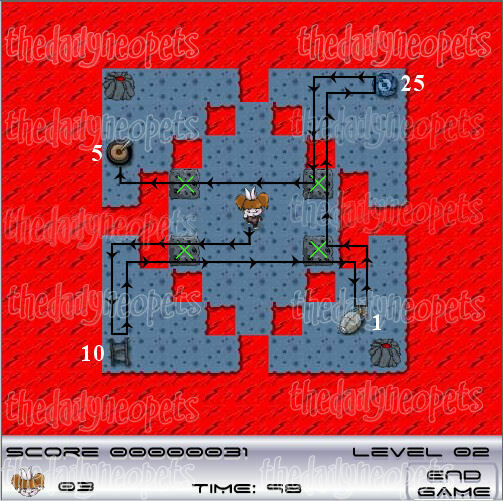 This level can be extremely tricky. I have not laid out a path for you because you never know what path you can take. This level has the enemies that kick blocks at you, so the blocks will move around to different places because of this. Just try to collect the pieces quickly and get out of the level as soon as you can. You will have to kick many blocks and you may have to shoot some as well. Good luck! 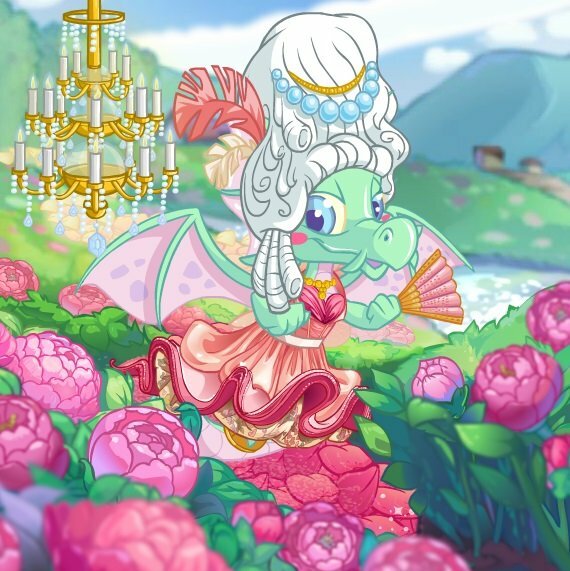 Relax this one is easy! 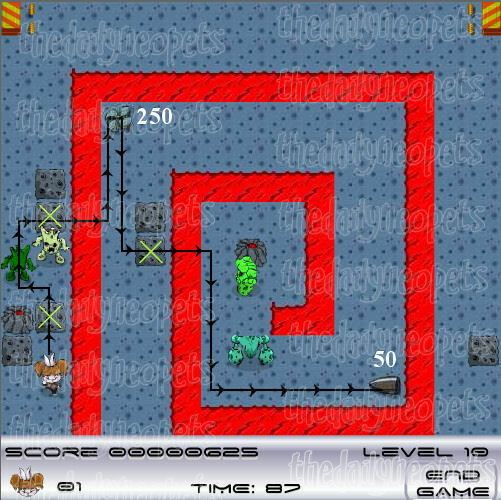 Just simply kick the blocks marked with the green X in the direction of the arrows and collect your ship pieces. The enemies will stay out of your way in this level if you follow the path indicated. Another pretty simple level. Just kick the blocks marked and in the direction of the arrows and hurry to your pieces. The hardest part is getting around all of your enemies. 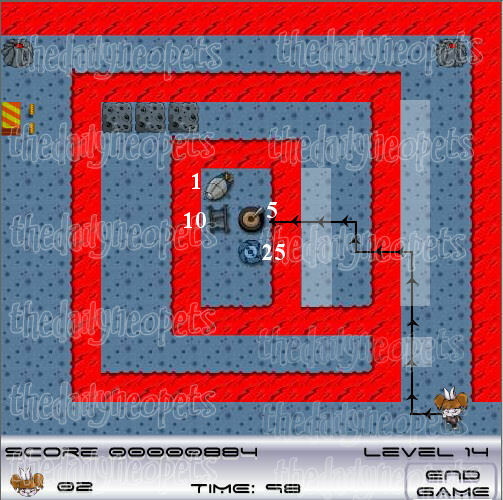 This can be tricky as well, just like level 16. 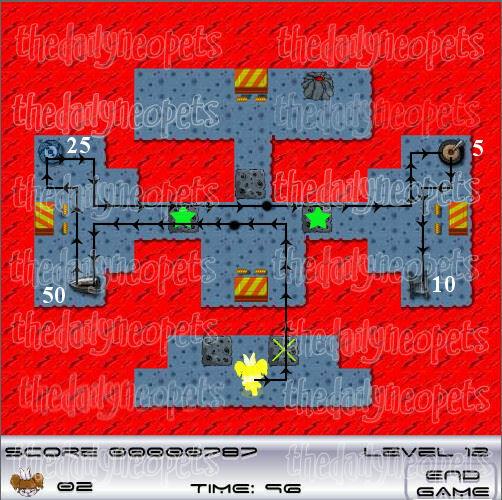 The enemies that kick blocks are in this level and you need to avoid them and the blocks they kick at you. I have laid out a path to take, it's the quickest way to collect the pieces. However, like level 16 you probably won't be able to take any specific path. Just try to get through it as quickly as you can and watch out for blocks and the enemies. Again this level isn't really that hard. Take the path indicated and kick the blocks where they arrows say to kick them and you should be fine. Just watch out for enemies on your way! It can be handy to know what kind of crates the enemies are spawning from, as different robots behave differently. 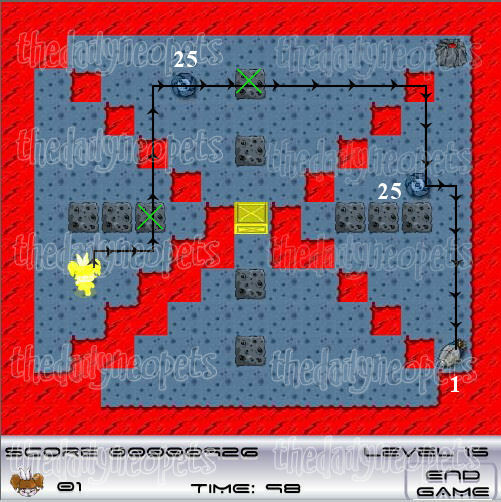 Robots who spawn from yellow crates will shoot rocks at you, as will robots who spawn from silver crates When the silver-crate robots are shot with a rock, they turn into a pile of rubble which may remain on the playing area for the rest of your game. Robots from red crates (appearing in the last 2 levels) do NOT shoot rocks at you. However, if you hit them with a rock, they will regenerate, whereas if you shoot them with the laser, they turn into a pile of rubble and will disappear from the playing area. Thanks to Azienskieth for the info about the robots! The main thing to remember in Moon Rock Rampage is to watch out for the enemies. They are what will stop you from completing the game. If you follow the paths that are indicated for each level you should be able to finish the game relatively easy. Remember to use your three cheat codes to help you out throughout the game. This game will take some practice to get through, and once you've played enough you will remember what path to take for each level. Have fun, and watch out for those enemies! The Snowager is awake. He'll be sleeping in 4 hours, 23 minutes.